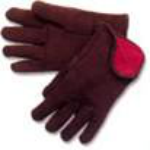 Emerald Brown Jersey Red Fleece Lined Gloves provide a soft lining for enhanced comfort. Available in bulk pack and tagged options, these gloves are ideal for general maintenance, construction, gardening, and protection from the elements. Emerald Brown Jersey Gloves are also clute cut. The clute cut pattern consists of a one-piece palm with no seam at the base of the fingers, and a straight thumb. Seams can be found on the inside of each finger. This is designed to give those wearing the glove a more spacious fit, and is also more economical compared to gloves with additional sewn seams. Each heavy weight glove is approximately 14 oz. and made from a cotton/poly blend. Packaged 25 dozen pairs per case.